Atty. 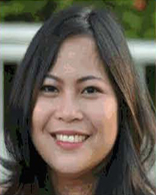 Maria Zarah R. Villanueva-Castro graduated from San Beda College in 1996 as class valedictorian. She has been a professor of law at the San Beda College of Law and a bar lecturer at various law schools and review centers. She is currently an in-house counsel of Manila Electric Company.